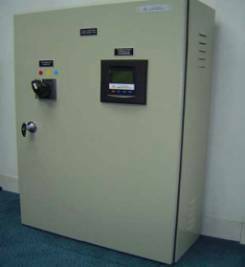 A ACTIVECAP Real Time Capacitor Bank is a micro-processor control, high speed, power device that controls the voltage or power factor in an electrical system. Using state of the art thyristor switching technology power capacitor steps are rapidly switched (typically 20-500ms) out of the network in response to continuously changing load conditions. With appropriate control, the voltage, power factor, load balance or a combination of these variables is kept within close tolerance to predefined user selectable limits. Thyristor switched capacitors are available to the electrical distribution and industrial engineer in the form of building block modules. High speed, transient-free, solid state switching of power capacitor banks is now available as a standardized self-contained unit easily integrated into existing distribution or industrial power systems. 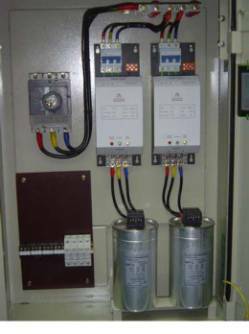 This product provides high speed voltage regulation or power factor correction. By virtue of its modular design, ACTIVECAP can be built using as many capacitor steps as required for the particular application. As the load grows, expansion of the compensation equipment can easily follow by addition of further capacitor steps. Typical ACTIVECAP Real Time Capacitor Bank construction consists of a number of ACTIVECAP Switching Controllers, capacitor steps and a ACTIVECAP Intelligent System Controller. 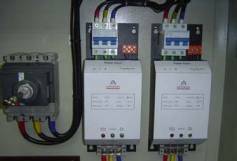 Accessories include main isolator or circuit breaker, main copper busbars, and control components. ● Reducing voltage fluctuations, reactive power flow and harmonics, enhances stability and reliability of the electrical plant distribution. Neighboring consumers will also experience improvement is the quality of power. ● Keeping the power factor close to unity reduces power factor penalty charges and enhance energy saving. ● Providing additional voltage capacity during heavy motor starting conditions, costly downtime due to under-voltage tripping is prevented. ● Load balancing single phase loads in three phase networks increases available capacity of existing distribution systems. ● Allowing simultaneous operation of electrical machinery increases industrial production output. ● No arcing occur during switching of capacitor steps lengthens the services life of capacitor units. Installation is simplified by the use of pre-engineered modular units and the complete testing performed on every ACTIVECAP system before shipment. Estimated installation 1-2 days. Complete installation and operation manuals are provided. ACTIVECAP can be delivered for on-site installation or factory installed and tested in a pre-fabricated transportable modular building. Where external protection of the capacitor units from long-term overloading or short-circuiting is to be provided, a value between 1.43 and 1.8 times rated current should be adopted. The fuses should be of the slow-blowing type owing to the high momentary current at make. Connecting cables should be designed for 1.5 times the rated current values and upwards. The diameter for cables and the fuse ratings are minimum values valid for operation under normal conditions and at an ambient temperature of 300C; higher values shall be selected if conditions differ from normal (e.g. in case of harmonics). This controller serves as a central power analyzer which measures a large number of parameters including harmonics up to the 13th. 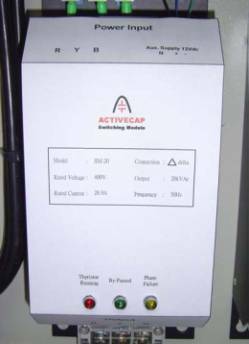 ACTIVECAP switching module is the most advance capacitor step switching device. This module makes use of the combination of thyristors and electromechanical contactor to give the most advancing technologies to achieve the best performance of switching mechanism and to improve the services life of switching devices. When the switching modules receive an external switching signal, it will automatically search for the optimum timing for switching in capacitor steps and guarantee at zero point cut-in, no transients, no arcing, low losses, no harmonics, over/under voltage and phase failure protection. An indicating lamp is provided to shows it’s working conditions. The thyristors and electromechanical contactor is connected in parallel. A micro-processor will detect the system parameters and make sure the thyristors conduct at zero voltage and cut-out at zero current. This module fully usable of the advantages of thyristor switching technologies After conducting and system in stables conditions, the electromechanical contactor will energize to bypass the thyristors. When switching out is necessary, thyristors will cut at zero current after the contactor dropping out. Because the switching occur at zero, no harmonics will be generated. If there are any under / over-voltage or phase failure, the module will refuse to cut in or cut out automatically. 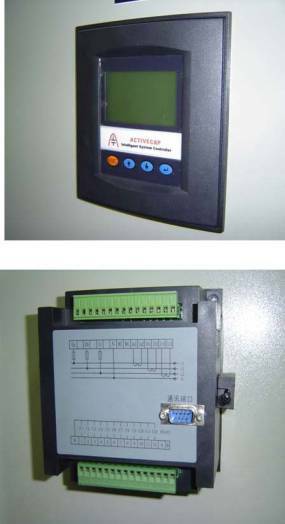 The application of the electromechanical contactor, control component consume power only at switching condition, no power will be consumed at rest conditions. Hence, it greatly reduces the power losses resulting less heat generation and lengthen the services life of the thyristors. Besides, the input signal and switching modules is galvanic isolation, no interference to each other will occur. ELECTRONICON's market knowledge and expertise together with a flexible manufacturing capability ensures that the company is able to offer capacitors for various applications utilizing differing technologies, namely MKP and MKPg. MKP– capacitors consist of polypropylene film metallized on one side and encapsuled by viscous resin; MKPg-capacitors are filled with a neutral insulation gas.